Landowners were particularly regarded as influential to the key issue of logging and chiefs on decisions affecting culture. In contrast, teachers were perceived to have little influence, although both teachers and church leaders were associated with law and order issues. The influence of Government Departments was strongly related to the issue being considered. However, in comparison to other departments, Public Works and the Environment Unit were generally regarded as having less influence. Notably Public Works and the Dept. of Lands were linked to influence on traditions in Makina, probably related to their impact on traditional land ownership. MPs to have a low level of influence. 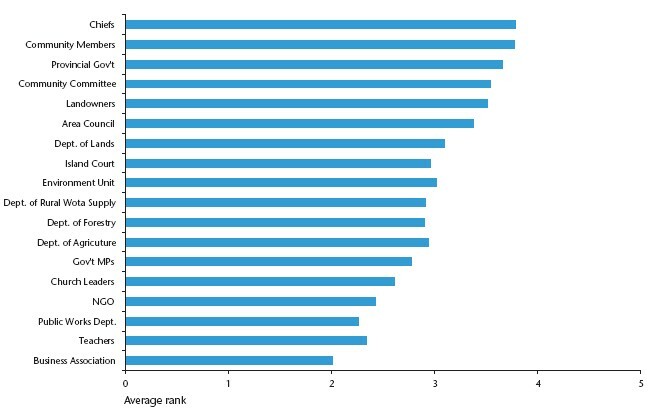 Government influence was seen as greater on issues such as water, sanitation, resource and environmental management, and less on cultural issues. The influence of NGO’s was particularly associated with water and sanitation issues. World Vision was identified as having particular influence in water sanitation, reflecting their past involvement in community projects. 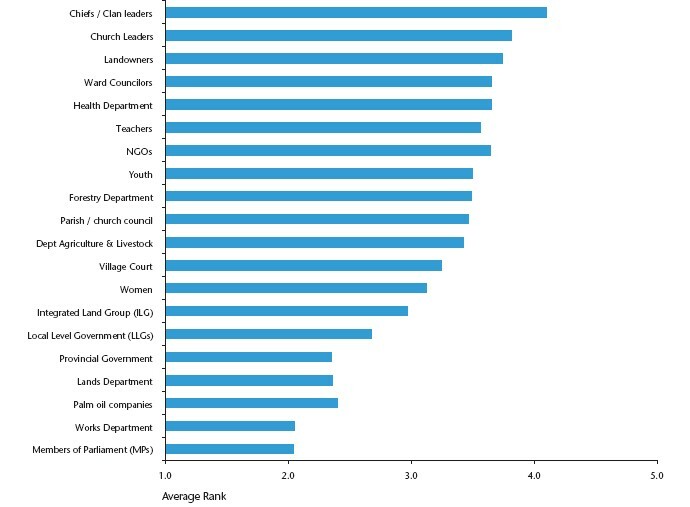 and Community Members were perceived to be the most influential groups in Vanuatu (Figure 6). However, Vanuatu results were somewhat problematic due to the difficulty that participants had in understanding and filling out the surveys. Only leaders and youth participated in Eratap and although each group participated in Mahe they only considered one issue per group. Although comparisons across priority issues were therefore not possible, several contrasting opinions were evident through participatory discussions. Generally, teachers and church leaders were considered to have little influence on decision making affecting most issues, with the exception of Mahe leaders who perceived teachers and church leaders to have significant influence on decisions regarding an Aid Post in their community. Equally the two participating communities had contrasting views regarding the influence of Government Departments; perceived to be low in Mahe but considered to have significant influence by Eratap participants. This may reflect access to services from the Departments and the proximity of Eratap to Port Vila, the capital city. The only exception was the Department Blong Rural Wota Supply (Department of Rural Water Supply), which had significant influence on water and sanitation issues in both communities. Chiefs and church leaders were perceived to be the most important groups for decision-making. Ward councillors, a group not present in other participating Pacific Island Countries also featured as a highly influential group (Figure 7). Interestingly it was particularly evident from one community (Silanga) that perceptions varied between community sections: women identified a wider variety of groups with influence over water issues along with a higher recognition of local Government and youth had a stronger focus towards the community members, chiefs and church leaders (Figure 8). Non-Government Organisations were mentioned by a few participants, in particular New Britain Palm Oil Ltd and AusAID. 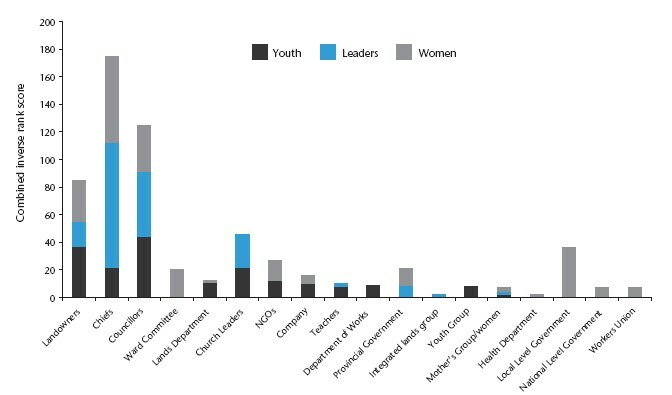 Government representatives at all levels were consistently considered to have high influence and decision-making power across all identified priority issues; water and sanitation, land disputes and health education. Government Departments were also perceived to have significant influence, especially with regard to water and sanitation. The Departments of Health, Works and Lands were those most highly rated; however during the focus group dialogue and leaders interviews, these same departments were highly criticized for providing very little or no services to the communities.